“Larger than life” is an almost criminally overused descriptor, especially when applied to rock stars and celebrities, but if anyone is truly deserving of the title, it’s Freddie Mercury, lead singer of the rock band Queen and subject of the recent biopic “Bohemian Rhapsody.” Everything about Mercury—a semi-closeted South Asian man whose monumental vocal ability and flamboyant stage presence took the swaggering, macho world of 1970s rock and roll by storm—practically begs to be immortalized on screen, so it’s a shame the end result fails to live up to its subject matter. Let’s start with what “Bohemian Rhapsody”—which follows the musical trajectory of Queen set against the backdrop of Mercury’s increasingly rocky personal life—gets right. The chemistry between Mercury (Rami Malek) and his bandmates (Brian May, Roger Taylor, and John Deacon, played by Gwilym Lee, Ben Hardy, and Joseph Mazzello, all of whom bear an uncanny resemblance to their real-life counterparts) is palpable both onstage and off. The musical numbers, thankfully, are another one of the film’s strengths, memorably showcasing both the band’s flair for showmanship and willingness to experiment. Both the relationship between Queen’s members and the inventiveness of its music are best displayed during multiple montages of the band’s recording process—the most delightful of which depicts the recording of the titular song “Bohemian Rhapsody.” Watching Mercury push his bandmates to sing ever higher and play ever louder is much like watching a great concert: both exhausting and exhilarating. 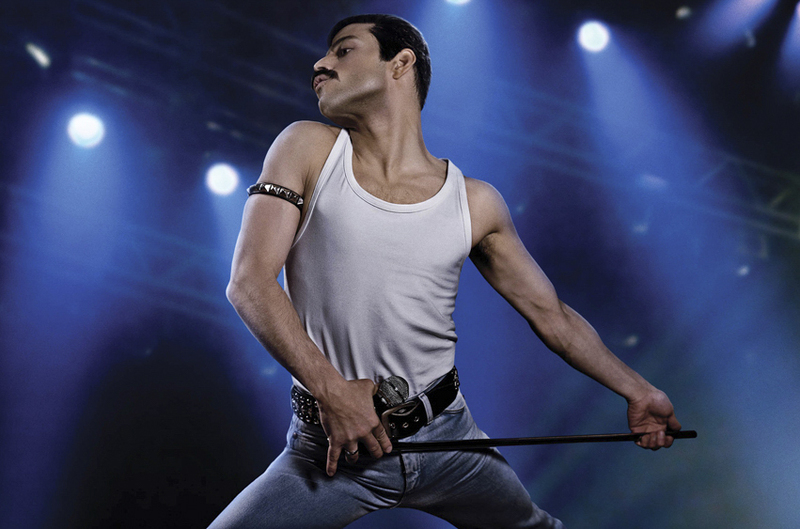 Malek’s performance as Mercury is another highlight of “Bohemian Rhapsody.” Actually, “highlight” doesn’t even do him justice; the actor might be the film’s saving grace. Despite a distracting set of prosthetic teeth (which are meant to simulate Mercury’s distinctive overbite but instead lend him a vague resemblance to a cartoon rabbit), Malek embodies all of Mercury’s campy theatricality without crossing the line into caricature. Malek’s performance, electric as it is, is not enough to revive “Bohemian Rhapsody’s” lackluster storytelling. To be fair, the movie faced multiple challenges during its production; Sacha Baron Cohen, the actor originally intended to play Mercury, quit the project early on due to creative differences, and director Bryan Singer was fired due to absence from the set and replaced with Dexter Fletcher (Singer is still credited as sole director). But these setbacks are not enough to explain the film’s pitfalls. The story moves from plot point to plot point almost as if crossing items off a checklist: Mercury impresses May and Taylor with his four-octave vocal range, leading to Queen’s formation, which is rapidly followed by the band recording an album, gaining the attention of a record label, and going on an international tour. Their meteoric rise feels like a foregone conclusion, not just to viewers who are obviously already aware of the Queen’s success, but to the band members themselves. As a result, none of their artistic risk-taking feels truly risky, and the band members’ arguments with each other and with record executives (all of which feature a number of ridiculously unsubtle lines about crossing genres and refusing to compromise their vision) don’t contribute any real tension to the story. What dramatic tension the film does have comes from Mercury’s own personal life and relationships, and this is where the movie really goes off the rails. During the production of “Bohemian Rhapsody,” the biggest fear of many Queen fans—myself included—was that the film would gloss over or erase Mercury’s sexuality. It doesn’t, but what it does is almost worse. Mercury’s realization that he is attracted to men and subsequent separation from his fiancée Mary Austin (Lucy Boynton) is framed as something of a turning point for both him and Queen, as if his hedonism is somehow a byproduct of his sexuality. Mercury’s drug abuse and wild parties—which draw him further apart from his bandmates, who are marrying and settling down—only really kick into gear once he grows a mustache and starts going to gay bars, implying that his conflicts with the rest of Queen (his “real” family) are purely a result of getting in with the wrong crowd (the “wrong crowd,” in this case, just being gay men who like to party). It’s a regressive and remarkably unkind way of addressing Mercury’s admittedly complex relationship with his sexual orientation, and it leaves a sour taste. The strengths and weaknesses of “Bohemian Rhapsody” are all displayed to their fullest in the movie’s finale, which consists of Queen’s legendary performance at the 1985 Live Aid concert in London. The storyline leading up to this performance is rife with historical errors. First of all, it treats the concert as a reunion performance for Queen after Mercury breaks up the band (against their will) to record a solo album. This never happened; Queen never officially separated and while Mercury did release a solo album, he was the third member of the band to do so. The movie also falsely portrays Live Aid as taking place soon after Mercury is diagnosed as being HIV positive, when in reality he would not be diagnosed for another two years. Both these inaccuracies seemingly exist only to wring more emotion out of the band’s interactions; the first allows for a dramatic breakup (and subsequent reunion) while the second leads to a scene in which Mercury reveals his diagnosis to his tearful bandmates during their rehearsals for the Live Aid concert. It’s not clear what purpose either of these scenes serve. Perhaps they’re meant to make the other three band members look sympathetic (Taylor and May did both serve as consultants on the film), or to add an extra note of triumph to the final performance. The fact is, this scene doesn’t need any extra help to be triumphant. The finale shows the majority of Queen’s actual Live Aid set completely uninterrupted, an excellent choice that allows the most interesting part of “Bohemian Rhapsody”—the music—to take center stage. Malek’s commanding presence and the band’s infectious energy only grow stronger as the scene continues, and the end result is absolutely monumental. It might even be good enough to make up for the preceding two hours of narrative inconsistency. Then again, there’s plenty of footage of Queen’s actual Live Aid performance on YouTube. Perhaps you should save yourself the price of admission and just watch that. The Live Aid performance at the end of the film was worth the price of admission.